Visit our showroom featuring full size built-in displays featuring Window Coverings, Windows, Doors, more. We Offer Window Shades, Plantation Shutters, and Blinds to Compliment any Décor for Home, Retail Store, or Office. 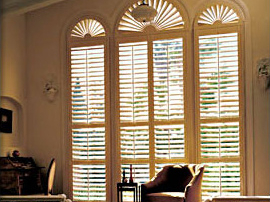 Plantation shutters are a beautiful and cost effective way to enhance the value of your home. We’ll help you select a style and finish, as well as explain your options for decorative and functional enhancements. We offer top quality Norman Plantation Shutters. The most popular is the Woodlore series and this manufacturer understands the needs of homeowners – you want an affordable quality product that will retain its looks as well as functionality without a lot of maintenance. Super easy to clean, with invisible tilt (hidden tilt), and motorized remote control option. That means you can open and close any or all the shutters at one time with the simple touch of a remote control device. 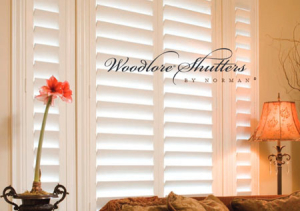 Watch the videos below to see Top Quality Plantation Shutters by Norman – The only brand we sell and install! The Woodlore series are made from solid MDF-core, which is a quality wood in its advanced state, to provide the best strength and density. The wood used to make them is from trees that grow rapidly, hence guarantying replenishment of tree forests at an accelerated rate. Moreover, the Woodlore’s UV inhibitor is fundamentally lead-free, and it does not release or produce any harmful organic compounds and protects against yellowing and color fading. At the same time, the polypropylene coating prevents staining, which guarantees long-term performance in various environments. There is no doubt that the Woodlore series is the best window shutter. The surface is extremely durable thanks to the patented polypropylene coating. This product withstands all types of climate even the harshest and are better than those constructed of PVC or Vinyl. Built with stainless steel staples, resistant to rust and corrosion and can take extreme heat. The wood stiles are engineered and reinforced thereby offering excellent structural integrity. 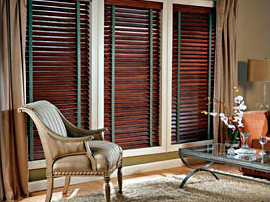 More durable and less expensive than regular hardwood shutters. If you are thinking about the easy-to-use remote control option for shutters – watch this video to see Remote Motorized Shutters by Norman – an optional we can add when you order the Sussex® series. Request a Quote today! Get started. Our professional staff is available six days a week to meet with you at your Home, on the Job Site or in our Showroom. Help prove you are human, not a computer (bot). Answer 21+2=? We also offer custom window blinds made of real wood or faux wood to fit your interior decor and budget. Window Blinds or Venetian blinds (the original name) date back to the early 18th century or before and have 2″ inch or 2 ½” inch horizontal slats made of real hardwood, faux wood, aluminum or plastic vinyl, and stack on top of each other held together by cloth tapes or cord. In the USA, window blinds with the wooden slats are referred to as wood blinds instead of Venetian blinds. The suspended slats using cords or wide cloth tape allow that the blinds can be rotated in unison up to 170 to 180 degree rotation. The proven way or method to build the best blinds that last for a long time is by using the best quality materials and hardware from the very beginning. Moreover, a company has to incorporate advanced manufacturing processes and practices to make the best. Reliability and durability are crucial when it comes to any window covering. As an expert in this industry, we know how important it is to maintain integrity in the manufacturing process, provide a product you are proud to have as window coverings for your home or business. Faux Wood Blinds are available in 2-inch slats and 2 ½-inch slats. If you prefer premium hardwood blinds that can be stained or painted to match your décor just ask us about the Normandy hardwood blinds for your home or office. Offering a custom solution with a variety of elegant hardwood valances and designer tape options. For more information talk to our specialists for custom window coverings, wood blinds, and plantation shutters in Orange County. Get directions to our Anaheim showroom located at 3445 East La Palma Ave. Anaheim, CA. Fill-in the Get a Quote form or Call us today (714) 953-7663 for a no-obligation Free Estimate and the best custom window treatment options for your home at affordable prices.